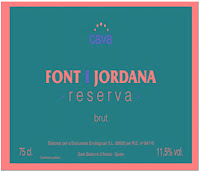 « Cava » is the champagne of Spain. 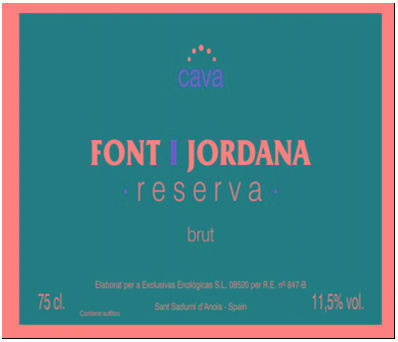 Generally produced in the Penedes region of Catalonia, northwestern of Barcelona, Cava, as its name indicates, is made and aged in limestone underground cave, similar to those of Champagne, hence its name. A blend of three indigenous grapes, Xarel-lo, Macabeau and Parellada, this 100% organic Cava possesses lovely, tight bubbles; enticing mineral and lightly toasted brioche notes on the nose, and beautiful balanced palate with lot nuances and mineral leading toward the dry finish. Owned by Gerhard and Brigitte Pittnauer, Weingut Pittnauer is located on the eastern shore of the Neusiedlersee (also called Lake Neusied in English) in Austria's Burgenland region, which is at the eastern extremity of Austria bordering with Hungary. The special micro-climate of this district is characterized by Austria's longest hours of sunlight, high humidity and moderate temperatures influenced by the large, shallow lake Neusiedlersee. The winery possesses vineyards with excellent exposure and location, which form the basis for their ambitious wines. The young couple Brigit and Gerhard Pittnauer are considered as St. Laurent specialists and their Pinot Noir is one of the best varietal representatives from Austria. Pittnauer is a 100% biodynamic winery. Weingut Pittnauer produces a few wines including 5 that are available in the US market through Savio Soares Selections: Blaufrankisch, Velvet, Zweigelt, Pittnauer Rot and our wine of today St. Laurent. Often characterized as Pinot Noir on steroids, St. Laurent is a grape found in Austria and southern Germany that is related to Pinot Noir, but it is much bigger in style than most pinots. The Klassik is a St. Laurent that sees only 6 months in used barriques. A fruit forward style of Austrian wine with dark cherries and blackberries on the palate. 100% Biodynamic! 100% St. Laurent handpicked, sorted and crushed into stainless steel tanks. Fermentation alcoholic occurs in temperature controlled stainless steel vats with natural yeasts only. The must remains on the skins for controlled extraction. The wine is then racked into French oak where the malolactic fermentation takes place and it is left in oak for 6-10 months ageing. 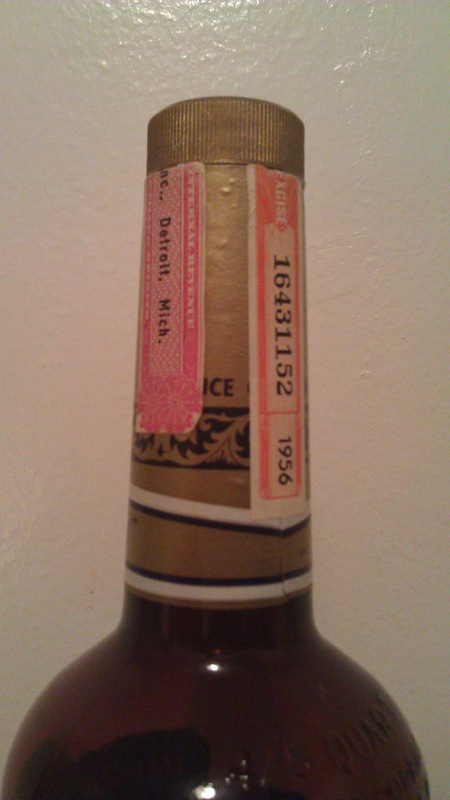 Once bottled, it spends several more months to rest in the bottle before release. The 2009 St. Laurent Dorflagen presents a dark, almost inky ruby color. On the nose delicate nuances of mint, minerals and citrus zest, nicely mingled with characteristic ripe black berries aromas and subtle herbal, earthy notes. 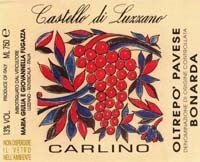 On the palate, complexity, freshness and refine acidity enhance the intense cassis fruit and other dark wild berries flavors. 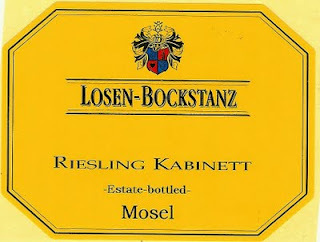 The finish is long and mineral with very good aging potential. It is a pretty exceptional, balanced, rich and enjoyable wine with great acidity, ripeness and other characteristics very specific to the St. Laurent grape. Highly recommended, especially if you never tasted a St. Laurent grape based wine. A few months ago, my boss received some old bottles of spirits and liqueurs from a friend, which were probably used as decorative bottles on a counter or on the top forgotten shelves of a bar somewhere. Somehow too old to be sold within the store and one of them being a Canadian whisky from 1956, which I found pretty incredible that a bottle from 1956 could still be standing 50+ years later, I asked my boss if I could take 1 or 2 for memory sake for my father born in late 40s (or for myself who knows). However, I ended up bringing back home 2 bottles: 1 bottle of Canadian Club 1956 and 1 bottle of DOM Benedictine probably from the 50s too. I put them on the top of my kitchen cabinet, thinking that one day I will send them to my father. Yet, a few days after Christmas, my wife and I welcomed a new addition to our little family, a beautiful little baby girl. We had something to celebrate, but my wife was at the hospital. Fortunately, a friend and my mum came for Christmas and stayed for a few days after; consequently, my friend and I, and because my mother doesn't drink whisky, we had to have a drink, and the bottle of 1956 Canadian Club seemed very appropriate for the occasion. Canadian Club is a brand of whisky from Canada. 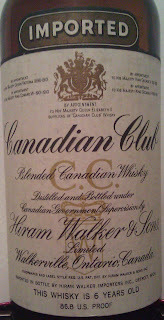 Popularly known as C.C., Canadian Club began production in 1858. 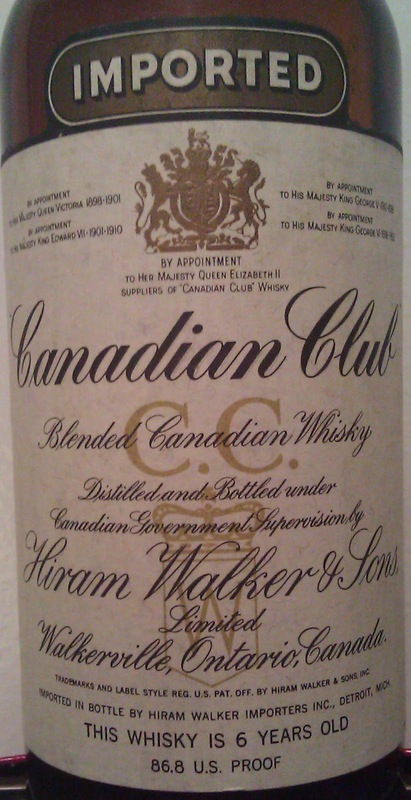 It was established by Hiram Walker, and was known as Walker’s Club Whiskey. 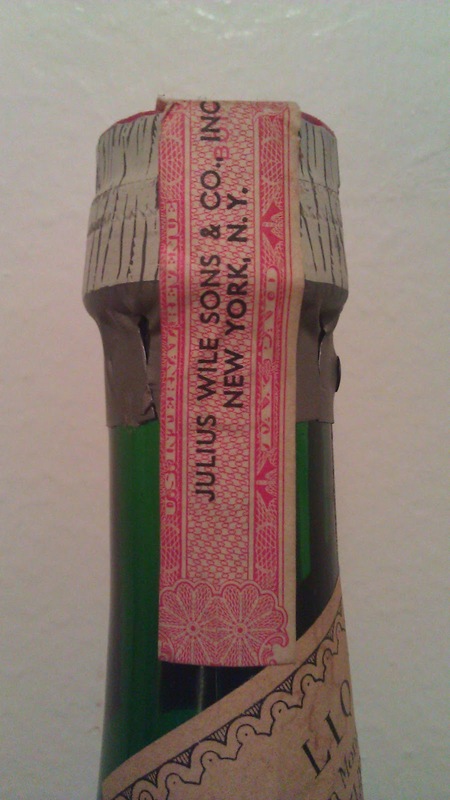 Surprisingly after all these years, the label or the plastic cork weren't even damaged and the whisky was still showing at his best. Light golden-amber color in the glass. The fragrant nose offered light touches of oak, spice and vanilla. The palate was light, gentle, smooth and lightly sweet, with no harshness in the finish. 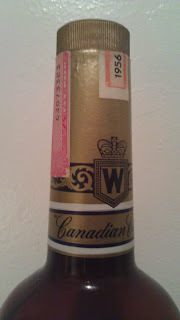 This Canadian whisky had some of the smokey, sweet flavor of bourbon, but its smoothness was somewhat similar and closer to an old Scotch whisky. Really enjoyable for a whisky boasting 86.8 US proof or 43.4% of alcohol, and that has been bottled 55 years ago. It was good a way to celebrate a new born. 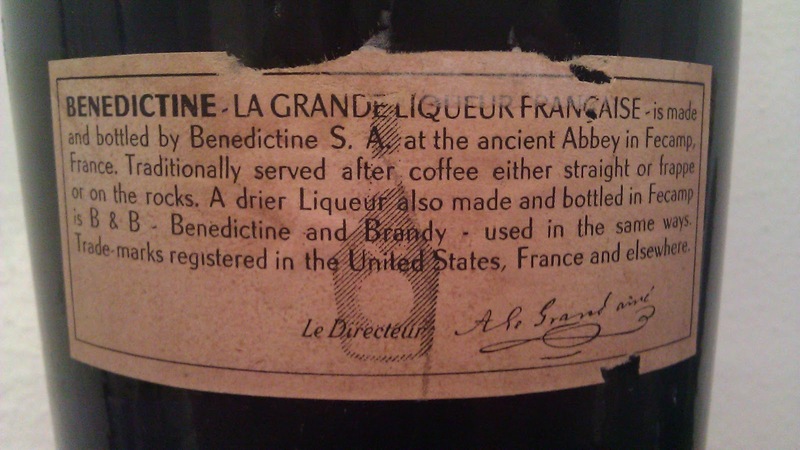 As for the Benedictine, it is still "throning" atop the kitchen cabinet. 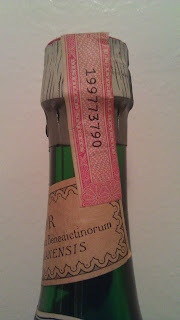 Here is a few pictures of the bottles and labels. Collectors, sorry! I will drink these two bottles at some point or another. Following, my last 2 recent posts about Sake and the Suzuki Shuzouten Brewery Hideyoshi Brand, and more especially after the last two earthquakes in Japan, it is important for me to express my concern and try to help in my own way, by promoting an event to raise money for the Japanese in need. Join Linda Noel Kawabata, a Certified Advanced Sake Specialist and USA Brand Manager for “Akita Sake Promotion and Export Council” (ASPEC), who came to visit me with one of the most eminent Japanese Sake brewery owner, Mr. Naoki Suzuki, last year and at the beginning of this year, and a lot of other concerned people, for a celebration of Japan's culinary artistry and traditional Japanese sake, in a unique fund raiser night, on Wednesday April 27th. 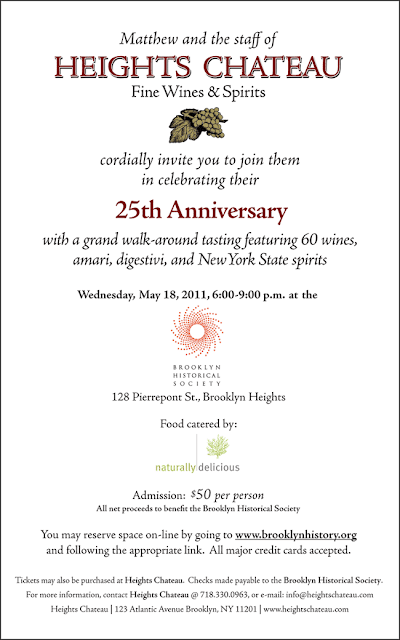 If you are unable to attend; please Donate..
No doubt, 2009 is an excellent vintage across the board in France, but in my opinion more particularly in Beaujolais. It is quite amazing frankly that most, if not all, 2009 Beaujolais that I tasted were ranging from very good to truly fantastic. There must be some bad ones somewhere, but I have yet to taste them. I will write soon about a great one that I loved, but here is one that I really enjoyed too. 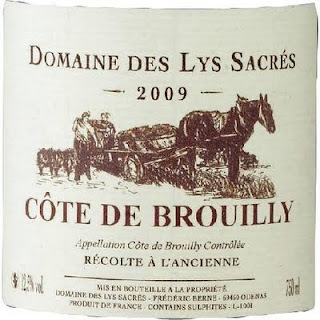 Domaine Les Lys Sacrés is located in the village of Odenas, about 3 kilometers south of Brouilly, in the Beaujolais region, a commune the French "departement" of the Rhône, part of the Rhône-Alpes region. 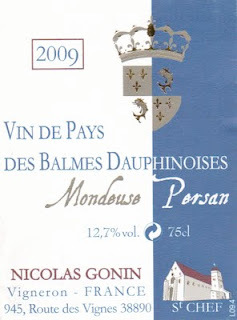 I know it is a bit confusing to think that all Beaujolais are produced in the Departement of the Rhône, and are not a part of the Rhône valley wines but Burgundy wines; and that most Rhone Valley wines are produced in the departements of "Isere" and "Drome" and not in the "departement" of the Rhône, but in the region of Rhône-Alpes. 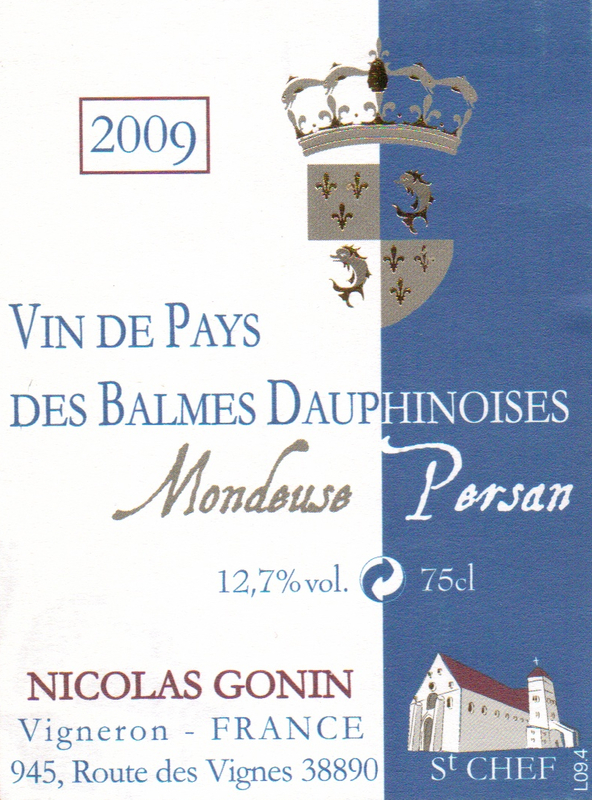 You may have also notice that certain producers stopped putting the name "Rhône" (for the departement after the village of origin) on their label to avoid the confusion. 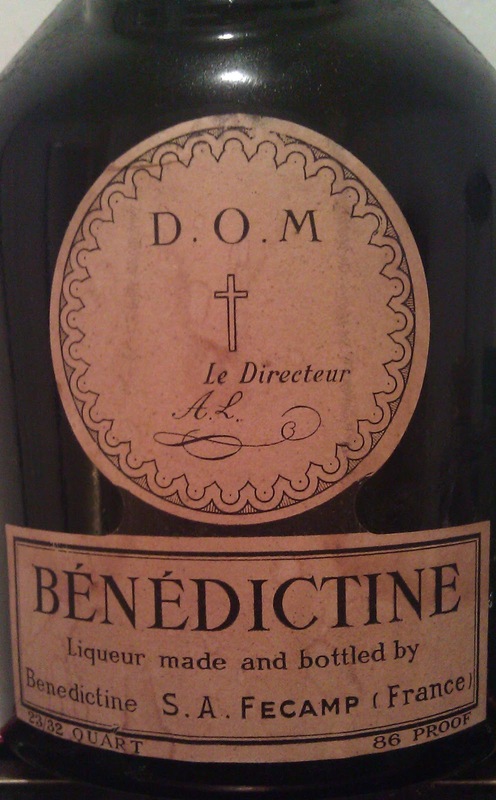 However, to go back to our wine of the day, this is a traditional estate, earthy and surely organic, that do everything the old way, especially the harvest as specified on the label: "Récolte à l'Ancienne" Work in the vineyards is done under "Lutte Raisonnée", which means natural and sustainable methods, adapted to the different vineyards depending on the quality of the vintage, with minimal use of chemicals (pesticides, herbicides, etc..) only when necessary. 100% Gamay, 2009 Les Lys Sacrés possesses a light purple-ruby color of medium intensity, with attractive reflects. The fresh and complex nose boasts aromas of cherry, ripe dark fruit, spices and herbs mingled with hints of minerality and smokey notes. 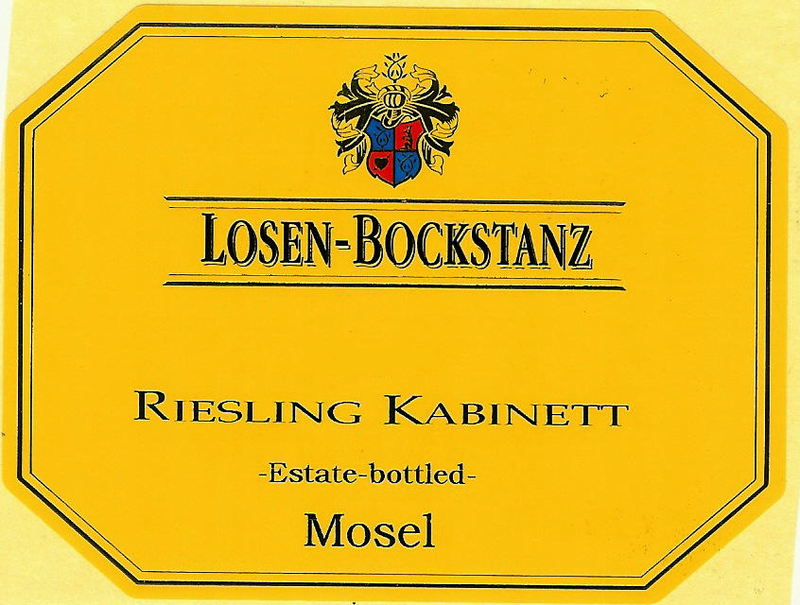 Offering the type of flavors, the palate is soft, balanced, well rounded and quite fruit forward due to the ripeness of the vintage, yet it feels summery and crisp due to a good amount of acidity. Overall easy going, friendly and very approcheable. The finish is quite long and juicy with velvety tannins. Somehow thirst quenching I must say. Very nice and versatile, it will pair well with charcuterie, hors d'oeuvres and more complex dishes based with poultry, game and grilled white meat like pork or veal. Unfortunately, I realized that with 2 kids, I have less time to write on the blog, because they are my priority and this blog is just for fun and to share some of my finds for the store with you. I also realized that most of the times I'm a bit too thorough and too long, so I will try to be more succinct or only write the tasting notes of the wine but with less rather than the full historic and description of the Domaine, which is going to be a challenge. Let's try. La Coume du Roy is a Domaine from Roussillon, nestled in the little village of Maury and renowned for its red wines, more especially its old vintage Maury sweet red wines, classified as VDN (Vin Doux Naturel). Maury is a village located in the northwestern part of the Roussillon region. It is also an "Appellation d'Origine Contrôlée" for wines, mostly red made from at least 75% Grenache Noir grapes, and a few whites and rosés. Other permitted grapes are Grenache Blanc, Grenache Gris, and (rarely used) Macabeu, Malvoisie and Muscat. Maury is well-known for its sweet, fortified dessert wines. Located in the Pyrenees-Orientales, near the French "departement" of "l'Aude", the appellation take its characteristics and its name from its dark schistous marls soil. Maury produces essentially "Vin Doux Naturel" red wines presenting various styles depending on the vinification and the ageing process. Great as an aperitif when young, the sweet Maury bear the characteristic of the Grenache grapes with flavors of "Griottes" (wild cherry) and other dark wild berries. With time, they generally evolve towards old prune, fig and jammy fruit, and pair well with cheese and chocolate dessert, somewhat very similar to port wine. "Mas Amiel" is usually the name of reference for Maury, yet "La Coume du Roy", although less notorious, is also a classic estate from this appellation and surely one of the oldest. La Coume du Roy is a beautiful Family story. 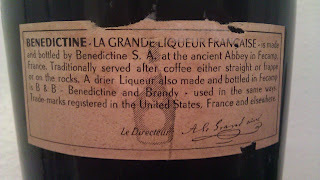 It is the story of the evolution of “Domaine de Maurydoré” which was later renamed “Domaine de La Coume du Roy”. Domaine de La Coume du Roy is one of the oldest cellars of Maury, having roots dating back to 1932, when it was still called “Maurydoré”, a brand name established by Désiré Esteve, the great-grandfather of the actual owner. Winemaking skills and knowledge have been transferred into the family for the past six generations. Today, Agnès de Volontat-Bachelet who took over the family estate runs this domaine of 25 hectares of vines planted on dark non-metamorphic and decomposed schistose stony soil. Maury: sweet red wines mainly crafted with Grenache Noir, blended with Grenache Blanc and Gris. Muscat de Rivesaltes: sweet white wine crafted with Muscat d’Alexandrie a Petits Grains. 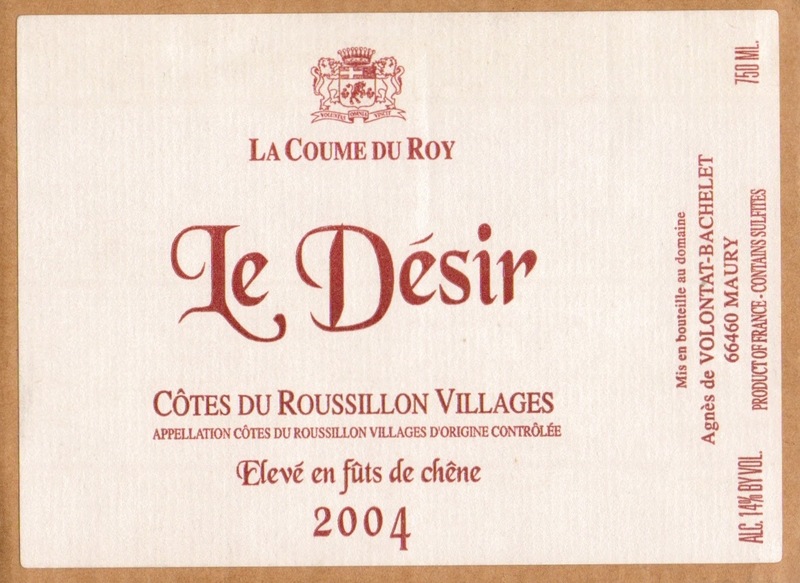 Côtes du Roussillon Villages Red: full-bodied, earthy red wine crafted mainly with Grenache, Syrah and Carignan. The love for their Terroir is also a family story because the Domaine still possesses some very old vintages of Maury that were kept aside for years by Désiré for the birth of all of his descendants. These rare gems are nowadays meticulously released on the market and available in tiny quantities. Aged in oak barrels for years, these old Maury are invaluable treasures for the Domaine and for your palate too when paired with cheeses, chocolate desserts or even a cigar. However, even If I love their old Maury that I had multiple occasions to taste, I just bought the 2004 "Le Desir" and here is what I thought of it. A blend of roughly 70% Grenache and 30% Carignan, 2004 "Le Desir" presents a fairly dark ruby-garnet color. Although still quite young, it already offers secondary and tertiary aromas on the nose (that are normally signs of age in older wines or wines that have aged too prematurely), with fig, old prune, ripe dark jammy and scorched fruits, earth, soil, leather, roasted nuts and slight woody notes. The palate also boasts complex earthy and Terroir driven flavors and nuances with ripe figs, roasted tomatoes, compote, red and dark ripe fruits, roasted nuts, chocolate and hints of oak. Quite balanced and juicy, a touch rustic but in a good way, the overall palate is soft textured, really approachable, with a solid yet integrated tannic structure and a long, earthy, chocolaty finish. Personally, I found it excellent, a bit old school and traditional, yet nothing abnormal or faulty. The fruit may feel slightly stewed and the nose a bit old, but I think it is more the style of the house than a fault, and remember that the climate and the soil in Rousillon are rather dry and arid and constantly swept by the Tramontane wind, which sometimes can result in sun drenched fruits that may be partially scorched if left too long on the vines. Yet, like I love them as a good Frenchman and a grandson of a winemaker, it is once again a wine for wine lovers and connoisseurs, surely not your everyday heavily marketed stuff, but in my opinion better and definitely worth trying.